Teaching you the art of wreath making one Seasonal Wreath at a Time! Save money and learn to make amazing wreaths from the comfort of your home! Ever searched for a special wreath but couldn’t find what you liked? Or needed a wreath in a specific color or style but the store didn't carry it? Maybe you've seen a designer wreath with a high price tag and thought, “I can make that for less”? That, my friend, is when you start making wreaths yourself! You'll no longer have to spend the money to have others create for you. Have signs fall off, break, sag or squish? Get confused on where to place flowers? Wonder where to find the best materials? Struggle with what ribbon combinations to use? Get stuck when it comes to making fun looking bows? Spend hundreds on supplies just to have them sit instead of putting them to use? 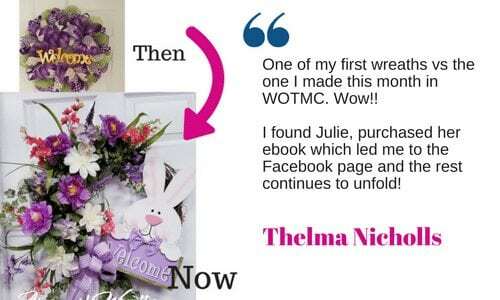 Hey there, I'm Julie Siomacco owner of Southern Charm Wreaths where we make beautiful handmade wreaths and teach you how to make and sell them. I'm a self-taught, stay-at-home mom who learned to make beautiful simple designs out of my garage! If I can do it, so can you! And just like me, you have dreams worth achieving. You have the right to wake up everyday empowered doing what you love. Listen, I already educate hundreds of thousands through my blog, ebooks and ecourses. 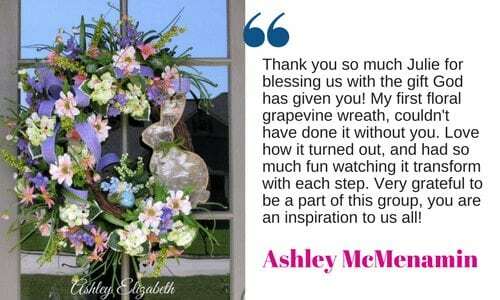 My passion is to teach you the art of wreath making and to make money with your creations if you choose. Your success is more important than just a sale to me, it is my calling. 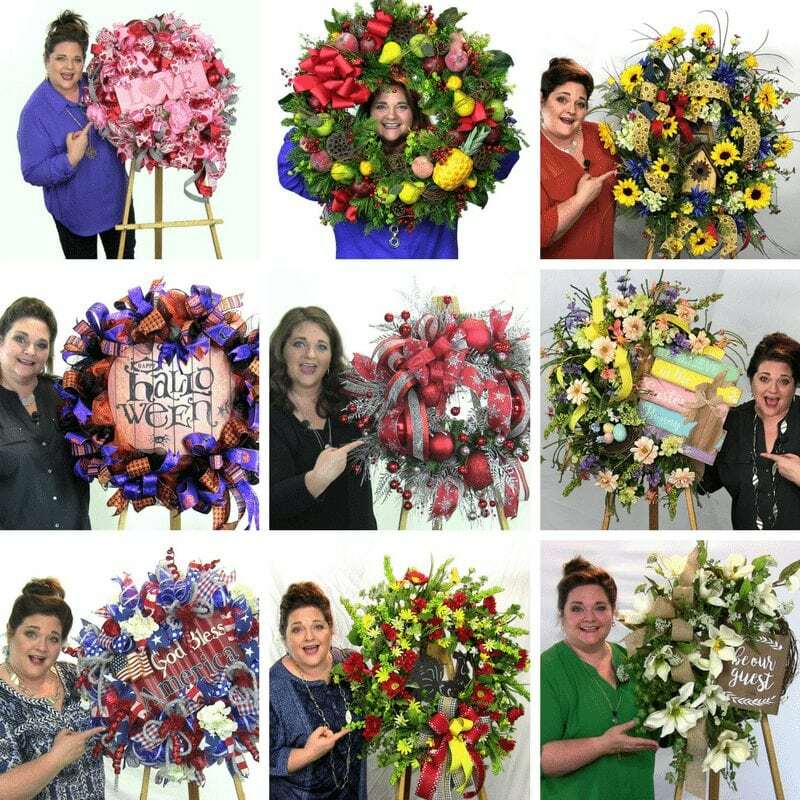 Over the past 10 years, I’ve taught HUNDREDS OF THOUSANDS of women and men how to make designer wreaths, and I know I can teach you too!! Don’t take my word for it, scroll down below and see the success other club members are having with my training. Access to watch EVERY training video we’ve ever recorded for our Wreath of the Month Club group; plus bonus videos and freebies! That’s over 120 videos total and still counting! 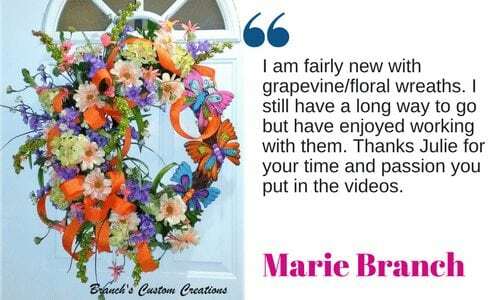 A new professionally recorded and edited feature video each month showing you how to make a beautiful wreath using different types of mediums you can watch even after you cancel. Featured training videos are now Closed Captioned for the hearing impaired. A supply list to download for the featured training video for that month and where to buy. 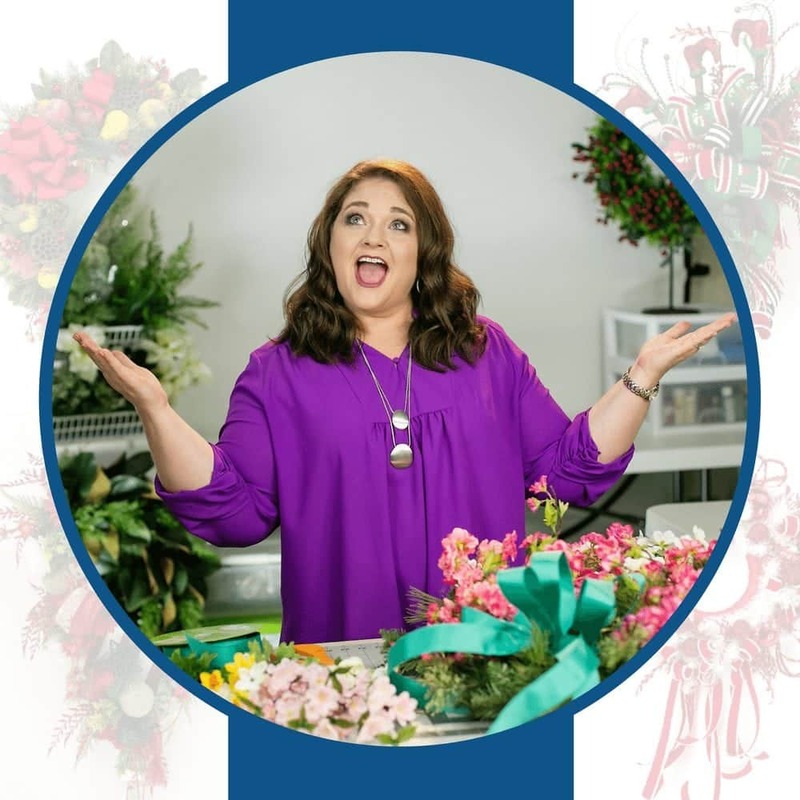 Access to a private Facebook Live broadcasts of Julie making a different style of wreath and explaining how to make it. A chance to be in the “hot seat”! Julie will critique your creations giving you a group coaching experience. 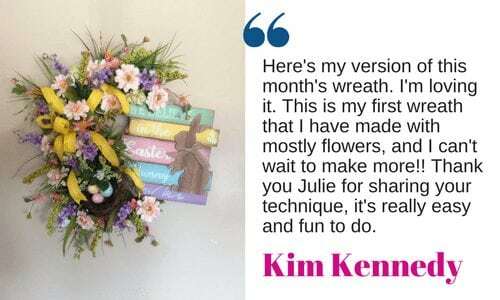 Access to Julie and a community of other AMAZINGLY talented wreath makers to give you feedback, encouragement and ideas. A variety of wreath styles from foam to grapevine to deco mesh and even felt. Access to videos, never seen before explaining the various wreath bases, tools of the trade, color selection and more. PLUS... wreath selling tips in our Etsy 101, Pinterest 101, Pricing and Facebook Page video tips. Are you a wreath making newbie? I welcome you! This club is for beginners and experts alike! Have you ever taken a class where you just didn’t get it? Don’t worry! I teach in a very easy manner and I promise, you WILL get it! Just search on the word beginner, for all of our beginner tutorials. Do you already make wreaths? I welcome you too! Anytime you get around other creatives in your industry, you WILL pick up a tip or two, maybe learn about a new product or discover something you didn’t already know. You'll be a CONFIDENT Wreath Maker in no time! Effective April 2018, Featured Training Videos are Closed Captioned! Join today to learn to make all of these wreaths... and more! After your purchase, click on the My Account link in the members portal area and then the large blue Wreath of the Month Club button. This gives you access to our video vault of over 50 training videos and files. There’s a link at the top directing you to our private Facebook Group as well as a link to download the current month’s supply list. All of the live teaching is done inside our Facebook Group (but you don’t need a Facebook to participate just access replays of the lives in the membership area). During the first few weeks of the month, I’ll upload a new featured training video showing you how to make a specific wreath with a supply list. During the next weeks, I’ll take any questions you have after watching the training. During the third and fourth weeks of the month, join me on a Facebook LIVE broadcast where I show you how to make a different style of wreath (typically one I need to do for a customer or list in my Etsy shop) or host guest designers who’ve I invited to go live in the group. Don't forget to show off your designs and if you choose, use #hotseat in the comments and I will critique your wreath giving you 1 on 1 feedback. YES! This is an update for 2018! You get streaming access to ALL the videos ever recorded in WOTMC (plus bonuses) as long as you are a current paying member. That’s currently over 50 videos training videos and includes business building videos too! What do I get to 'keep' for my monthly payment? Each month that you pay, you get to download a pdf file that contains a private link and password for watching that month's featured training video. Keep this pdf file and you'll be able to watch the training even if you cancel. You'll also get to keep all the friendships you make in our wreath club community and the wealth of knowledge you'll learn. Click below to choose your payment plan! Payment Policy – By purchasing this product, you understand that this an automatic recurring membership. You agree that your membership will automatically renew and charge your credit card on file unless a cancellation is made by either logging into your account at www.southerncharmwreaths.com/my-account or by contacting us here . No refunds will be made after 3 business days of the charge date.